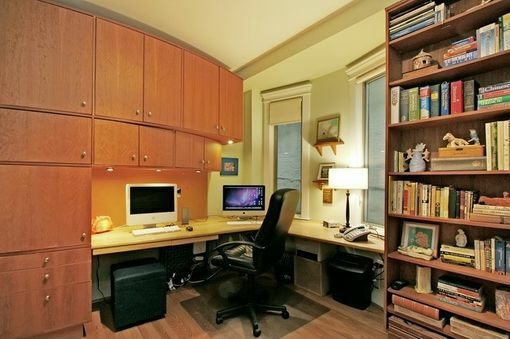 A high density home office, with solid maple work surface, curved cherry office cabinetry, cherry book storage, and double size murphy bed, whew. 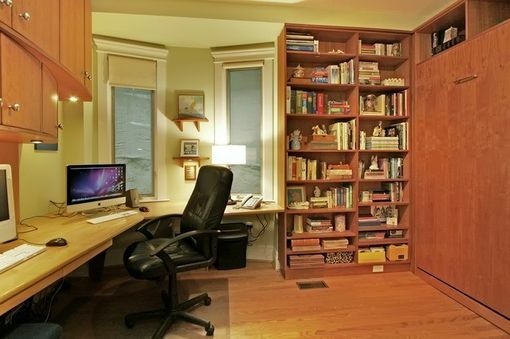 Designed as an intensively used home office for a busy family, it even has a hiding full size wall bed for overflow guests. The curved cabinets provide ample storage, and handsomely fill the wall. Curved doors, always make the solution extraordinary, not just because of their sensual feel, but often improved function as well. In this instance, the overhead cupboards added considerable volume to the storage capabilities; and with the curved doors raking away from above the desktop it maximizes storage depth, while still moving away; and at the same time the curves lead ones eyes naturally to the windows.